This individual Storm’s Stork Ciconia stormi is one of about 500 in the world population of this endangered species. This number is spread out over southern Thailand, Peninsular Malaysia, Sumatra and Borneo. The last stronghold for Sabah is the floodplains of the lower Kinabatangan river and the surrounding lowland forest including the Tabin Wildlife Reserve where this photo was taken. Continued reduction of such habitat has contributed to the decreasing trend in its population. The bird is generally solitary but likes to form small groups to soar in the late morning thermals. It was so big that I couldn’t miss. 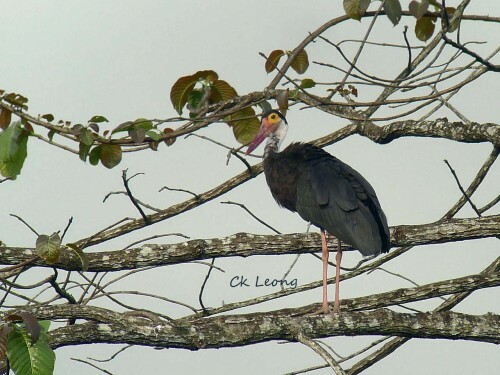 Last week while on the road to the Wasan ricefields in Brunei, this Lesser Adjutant came into view from the window of the car driven by Roger. What luck! we were travelling fast and it was a busy road. After making a u-turn to return to the scene of the crime, this little patch of marsh held not one but two of the storks. In local Malay language, it is called the bald-headed bird. Most birders I know give it a low score in the looks department. 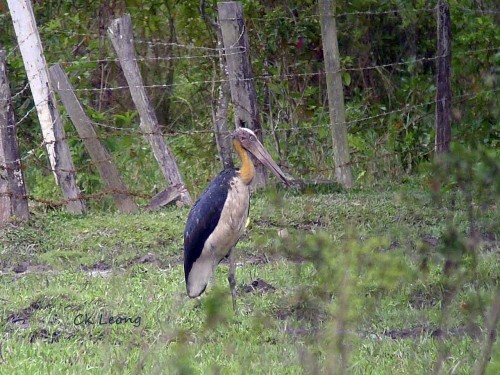 But storks are getting increasingly scarce and this particular one needs more space.